In celebration of my 4 January finishes...I am going to have a giveaway....so comment on this post and make sure that you send me your email so that I have a way to contact you. Post about my giveaway on your blog for an extra entry! Let me know that you posted on your blog so that I may check it out! I will draw on February 8th.....for this...Chez Moi charm pack and a heart hand knit dishcloth....Good Luck! Oh, I so love those bright colors in your quilt, so happy!!! Hi Vickie, I love the smores quilt! Of course they would love it, who wouldn't. 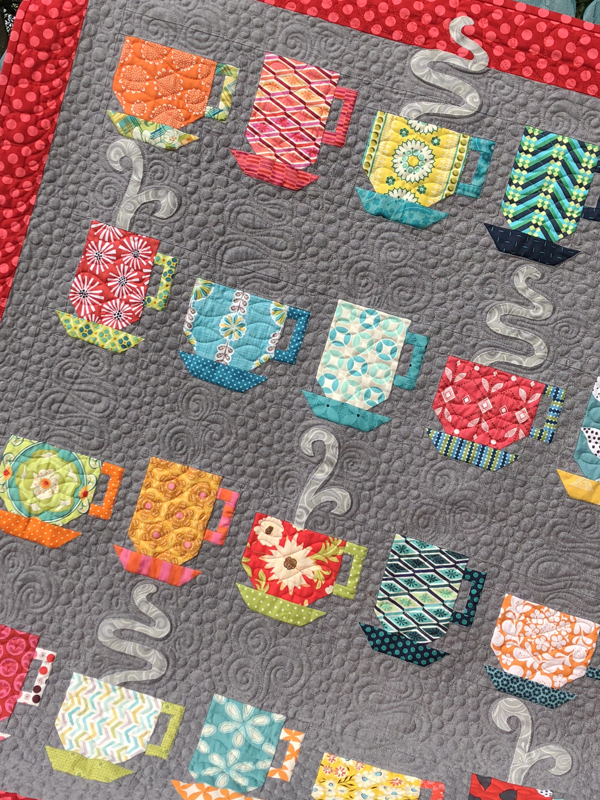 By the way, the first 2 of your quilts will be on your doorstep, probably tomorrow or Tuesday! Yay! The other 2 will go out Monday. I have to say that I saw your tutorial on Moda Bake shop yesterday and was wowed!!! I saw who posted it and was so excited for you. Congrats. I did leave you a comment there too! Can't wait to see more from you! The colors in the quilt are beautiful, I am not surprised that your girls love it. I already spotted that tutorial..so cool! I love that smores quilt, lucky girls! It is so bright and cheery. I will post about your giveaway, too. I'd love those charms and I was just thinking how I could use a new dishrag! That is beautiful! It was so easy, and it came out to be a really nice size. Thank you! Please enter me for your drawing! The S'mores quilt is darling and the colors are so happy. Love the tutorial bag too. Congrats for finishing 4 projects. I love your little zipper bag and your daughter's quilt is so lovely and cheerful. The quilt is so beautiful!! The little bag is cute. I'll be making one soon. So nice to get these projects done, cute Smores quilt. 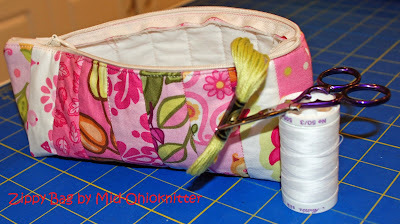 What a great little zipper bag, I'm going to make it sometime soon, great for gifts. Please enter me in your drawing. The quilt is beautiful, and the lil' zippered bag is so cute. Great giveaway. Love the Smores quilt! I bought a layer cake but never got around to making anything yet... there's always next year. 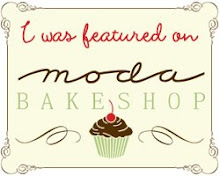 Congratulations on being on the Moda Bake Shop... how exciting!!! And the bag is very cute. I will have to make one. I enjoyed your tutorial on the little zipper bag. You made it look so easy...I think that I will try it. Thanks. I love your blog's new look! And all those cool photos too. I'm here to enter your giveaway too. I'm having one too in case any of your readers wish to pop in over there to sign up. Please include me in your drawing...love the fabric pack and what a sweet dishcloth! Your quilt is just yummy. The bright colors remind me of a candy shop. I would love to be entered in your giveaway - those cloths are the best! What a nice giveaway Vicki! And BIG congratulations for being a Moda Bakeshop contributor! Hi Vickie, I have the smores jelly roll sitting on my table. My daughter asked for a quilt made from it .... it has a snowman on it. So cute. Please put my name in for your giveaway. I'll post about your giveaway on my blog. The quilt is beautiful! What a wonderful use of color! Reminds me of Easter! Thank you for the link to Moda's blog and for creating the tutorials! Congratulations on your 4 finishes in January! I loved the colors you used on the quilt. Maybe I can use it as inspiration too? Thanks for the giveaway! Thanks so much for your bag tutorial. And your quilt is just beautiful. You are a very busy lady. I would love a chance to win, thank you! Looks great. And thanks for the chance to win. Love the fabrics and knitted cloth! I'm in! Thanks for the giveaway. That is one gorgeous quilt. I do like lots of bright/bold colours in a quilt, and the diagonal pattern works well. Thanks for sharing. Your quilt is lovely and I like you quilted bag very much! I will have to make one or two to hold my quilting and knitting tools! Thanks for the chance to enter your contest! 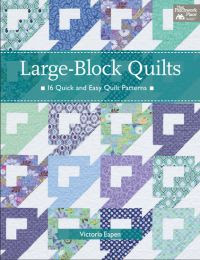 Love the quilts and the bright colors. I'll post about your giveaway on thisoldbatt.com. What a beautiful quilt. And I love the dishcloth. I am trying to learn how to crochet - dishcloths are on my list of things to make! That quilt is lovely! Very cute giveaway, please add my name to the draw - I love those washcloths, but I can't knit to save myself! I also left you a link on my blog about it. What a wonderful giveaway. I love the blue heart washcloth, I never did learn how to knit. Beautiful quilt! and I just love the little bag. I could think of a hundred uses for that. I saw the tutorial for it and the wheels started turning in my head. Hmmm... who do I know who'd like a little case? Hmmm... how about everyone! I just found your blog. How fun! you have some great projects going. I like your "WISP". I also like the idea of finishing projects. That way your quilts can be used and enjoyed by all. cute quilt, love the little bag, would be great for a sewing tote on the go. knitting dishclothes is something I want to learn to do. I saw your bag tutorial on Moda Bake Shop - so cute! Your creations are beautiful. Love all the bright colors. Great blog. Please enter me in your give away. Have a blessed day!! Thanks for the tutorial! I love the new Moda blog. Please add my name to hte drawing. I'll blog in my next post. I am encouraging others to make this cute Lil Zipper Bag. It goes together so easily. It only took me an hour. I can't wait to see what other tutorials you'll be coming up with! I found you via This That and the Other. What fun!! 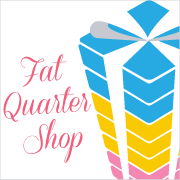 I can't have too many crafty sites in my bloglines!! The Smore quilt is lovely...I know why the girls love it. Did you make the dish cloth? It is a great color and charm packs are becoming an addiction. What a great quilt!! and thanks for the Lil bag tutorial.. this is a must do..just have to find the right material. Please enter me in your giveaway. Thanks! Thanks for the great giveaway!! Please throw my name in the hat. Love the smores quilt! So bright and beautiful. I just found your blog - cant wait to look around more! I am a long time quilter and just this past weekend started knitting. Havent gotten far, but am inspired by work like yours! Thanks so much and I will be visiting again soon!